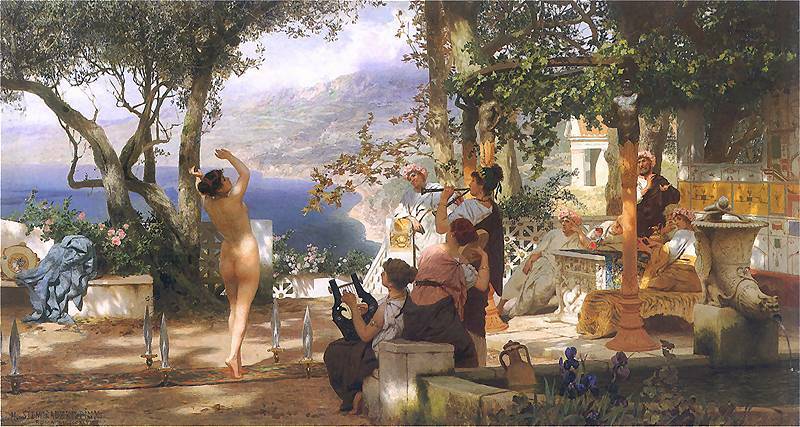 Henryk Siemiradzki’s painting titled Un Naufragé Mendiant was sold at Sotheby’s for the impressive amount of £1 082 500. The painting is described as one of the foremost specimen of the idealist genre art. Set in ancient context, it is highly representative of the artist's style. 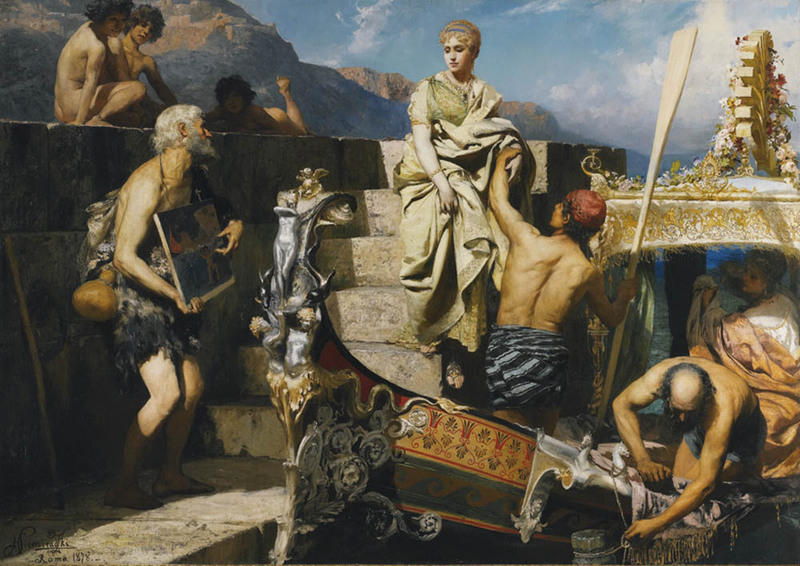 Measuring 208x293.5 cm, the work presents a beggar-castaway making eye contact with a Cleopatra-like gentlewoman, descending towards a barge. The tension deriving from the contrasting appearance of the two figures alludes to the ups and downs of fate. The work’s selling price ranked second in the auction that took place at Sotheby’s on 25 November, whose title was… Important Russian Art. The Polish artist indeed had numerous connections with the Russian academia and art scene: between 1864-70, he studied painting in St. Petersburg and was a member of the Russian Imperial Academy of Arts, and some of his patrons included members of the Tsar family. Siemiradzki was born in 1842 near Kharkiv (nowadays Ukraine, at the time part of the Russian Empire) to a Polish gentry family. The father of the artist served as an officer in the Russian army, however young Henryk was raised in the spirit of real Polish patriotism. Siemiradzki remained faithful to his Polish roots and upbringing throughout his life, despite the attempts to classify him as a Russian author consistently carried out by the country’s press, especially at the moments of his glory. Un Naufragé Mendiant was previously sold in an auction organized by Polswiss Art in Warsaw in 2000, when it went for 2 130 000 złoty (approx. £425 000). The work was apparently purchased by the Polish millionaire Ryszard Krauze, who subsequently resold the piece to the Polswiss Art’s owner Iwona Buchner. It is highly probable that, when applying for the permit to export the painting, the item was given a false title […], while the experts at the National Institute of Museology and Collections Protection did not decide to categorize the piece as a protected Polish cultural artefact, and released the artwork from the country. Works by the one of the most recognized academic painters are not often featured in auctions, but when they are, they usually reach sky-rocketing prices, both on Polish and international markets. The previous sale record of a painting by Siemiradzki took place at the Sotheby’s New York auction in 2011, where his Sword Dance was purchased for $1.8 million.